In 1974 behaalde Harm Jansen het solistendiploma Orgel “met onderscheiding" en werd vervolgens benoemd als docent hoofdvak orgel en kerkmuziek aan het ArtEZ Conservatorium te Zwolle. In 1977 werd hem de “Prix d'’Excellence” toegekend. In 1985 richtte hij Musica Vocalis op waarvan hij tot 2006 dirigent was. Residing in the town of Hattem, Harm Jansen studied organ, piano and church music as well as conducting at the conservatoires of Zwolle and Rotterdam. He also read Musicology at Utrecht University. In 1974, he was awarded ‘Solo Diploma in Organ with Distinction’ and in 1977 ‘Prix d'Excellence‘. In 2006, Queen Beatrix of The Netherlands appointed him ‘Knight in the Order of Orange-Nassau‘. Currently Harm Jansen lectures organ and church music at the "Hogeschool voor de Kunsten" (College of Music) in Zwolle. This in addition of being titular organist of the Great or Andreas Church in Hattem as well as the Broerenkerk (Broeren Church) in Zwolle. As organist and conductor, Harm Jansen is known for his wide ranging repertoire. For more than 20 years, he conducted the choir "Musica Vocalis" which he founded and with whom he performed many a varied concert. Mainly sacred music but also secular works with and without orchestra. Apart from the well-known Passion oratorios and Bach's Hohe Messe, he also conducted works from totally different eras such as Chansons by Poulenc and Hindemith as well as "Quattro Pezzi Sacri" by Verdi. 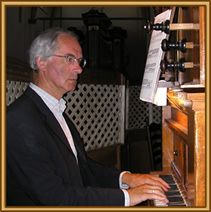 Harm Jansen can be experienced as conductor and as organist on a number of CD's.